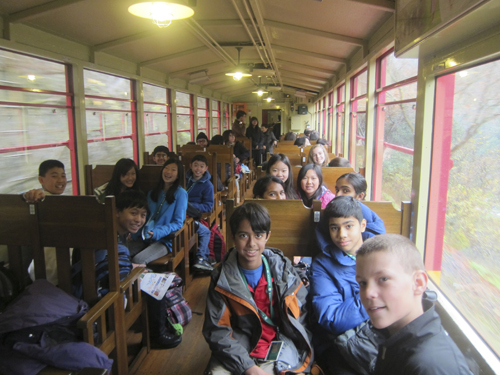 A group of 27 grade 7 students and four chaperones traveled to Japan in December to see the country’s many cultural wonders and visit their friends at Tamagawa Gakuen in Tokyo. The contingent spent the first stage of their trip traveling through Kyoto, Japan’s former capital city, viewing the famous Golden Pavilion, as well as visiting the Gion district, well-known as a center of geisha culture in Japan. There, they also painted fans using their own unique designs. Next, they boarded a bullet train bound for Hiroshima, where they visited Miyajima Island and its famous Itsukushima Shrine. “Although it was low tide, it was too muddy for the kids to walk up to the torii gate, but they were able to take many photos of this UNESCO World Heritage site,” said Jennifer Walrod, global education director. The students then revisited Kyoto to tour Nijo castle, the stronghold of the shogun during the Tokugawa era. Upon arriving in Tokyo, the students were greeted by a teacher from Tamagawa and escorted to their hotel. The next morning, they were greeted with excitement by their friends at Tamagawa, who treated them to a special welcome ceremony. Over the next few days, the students attended classes with their Tamagawa buddies and visited various sites around Tokyo, sampling the many different foods and treats.